Who will remember the girls burned to death in the Hogar Virgen de la Asunción in Guatemala? Yesterday, March 8, 2017, a fire broke out in the Hogar Virgen de la Asunción, in Guatemala. At last count, 32 girls burned to death yesterday. As with the Topo Chico prison fire, in Mexico last year; the Kentex factory fire in the Philippines, in 2015; the 2013 Rana Plaza Factory fire and the 2012 Tazreen Fashion Factory fire, both in Bangladesh; and the Armadale Juvenile Correctional Centre fire, in Jamaica in 2009, this was more than an avoidable and predictable tragedy. It was a brutal and planned massacre, and like Kentex, Rana Plaza, Tazreen and Armadale, it was femicide. And like Armadale, the State chose the most vulnerable girls and burned them, alive, at the stake. Once the requisite lamentations and invocations of the tragic are done, who will remember those girls? If history is any guide, their families and communities, a cadre of activists, and no one else. Seven years ago, almost to the day, we reflected on the aftermath of the Armadale fire, in Jamaica: “Someone was meant to die at Armadale, and that someone was meant to be a young woman, a girl. Which girl, how many girls, remained open. But someone was meant to die there, in a fire. And someone did. And she was a young woman, a girl. And absolutely no one can claim ultimate responsibility for that until they have transformed the everyday world of ordinary women and girls in which women are the fastest growing prison population, and women are the majority of sweatshop workers.” Now, after the fire at the Hogar Virgen de la Asunción, we can add “girls under care” to women and girl prisoners and women and girl sweatshop. Yet again, while many are shocked, no one is surprised. The theater of cruelty is always played out in the open. The Hogar Virgen de la Asunción, near Guatemala City, is variously described as a government-run “shelter”, a “home for children”, a “safe home”, a “children’s care home”, a “home for abused teens”. The only accurate part of those descriptions is that the Hogar is government-run. 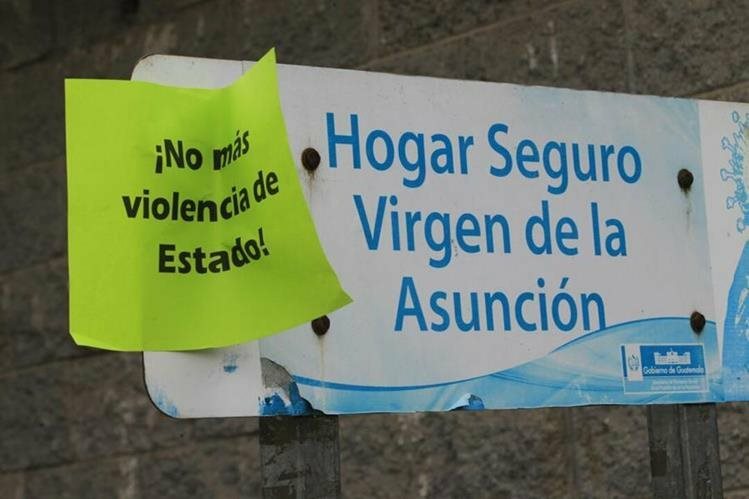 By all accounts, life inside the Hogar Virgen de la Asunción has been a living, and dying, hell of torture; intimidation; sexual violence; toxic overcrowding; inadequate and rotten, infested food. On Tuesday, 40 some girls decided that they had had enough, and staged a mass escape. Riot police stopped the escape and returned the girls to the “home”, where, as punishment, they were locked in their dormitories. Wednesday morning, one of the girls set fire to her mattress. She cried out that she would sacrifice herself “so that everyone would know what they were living inside.” Everything else is silence and smoke. As of late this afternoon, 12 of the sacrificed girls’ names have been released: Rosa Julia Espino Tobar. Indira Jarisa Pelicó. Daria Dalila López Mérida. Ashely Gabriela Méndez Ramírez. Sonia Hernández García. Mayra Haydé Chután Urías. Skarlet Yajaira Pérez Jiménez. Yohana Desirée Cuy Urizar. Rosalinda Victoria Ramírez Pérez. Madeleine Patricia Hernández Hernández. Savia Isel Barrios Bonilla. Ana Nohemí Morales Galindo. We did not want to lose them. Who will remember them, who will remember their names, once the invocations of tragedy have passed?